Greenhouse gases have risen sharply since 1958, primarily due to the Industrial Revolution. Since the dawn of the Industrial Revolution, humans have increasingly been contributing unnatural sources of greenhouse gases into the system, causing the system to become unbalanced. The Earth maintains a habitable temperature due to the Greenhouse Effect, which allows heat from the sun to penetrate our atmosphere, where it is absorbed by the Earth’s surface or radiated out and reflected back to Earth by greenhouse gases in the atmosphere. Without it, the Earth would be a cold and hostile planet, and would most likely be uninhabitable. However, maintaining the natural balance necessary to keep the Earth’s temperature within a range that is viable for life as we know it is a very fine line that can easily be crossed. Greenhouse gases are naturally occurring gases that pose no harm when they are in balance. However, when they are present in excess, the system becomes unbalanced and things start to go awry. The most important greenhouse gases are carbon dioxide, methane, nitrous oxide and water vapor. While all these gases occur naturally in the atmosphere, emissions from human sources has caused their levels to rise to a point that is no longer sustainable. 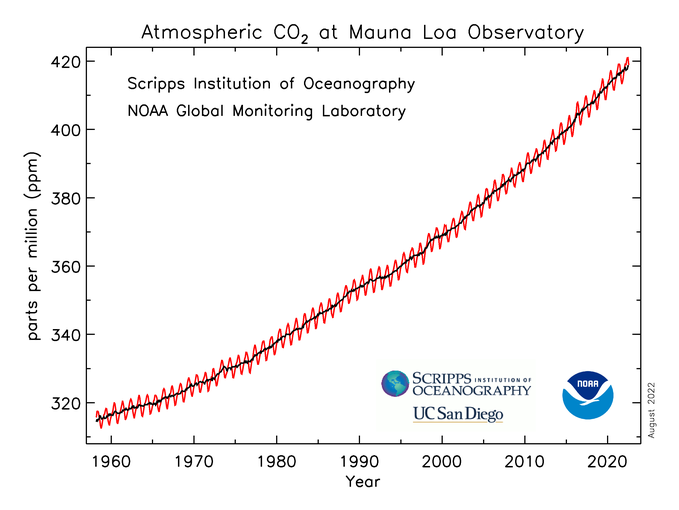 Atmospheric carbon dioxide concentrations have risen by more than 40% since scientists first started recording these levels, from 280 parts per million (ppm) in 1958 to over 400ppm today. According to NOAA2, over the past 800,000 years, atmospheric carbon dioxide concentrations have fluctuated between 180 ppm during ice ages to 280 ppm during warm interglacial periods. Atmospheric carbon dioxide concentrations are not only higher than they have been in over 800,000 years, the current increase that we are seeing today is more than 100 times faster than that experienced at the end of the last ice age. This is largely due to human activities; primarily the burning of fossil fuels, but also due to deforestation as a result of logging for timber and clearing for agriculture and development. Burning Fossil Fuels: burning coal to generate electricity, burning oil to power vehicles and aircraft (vehicle emissions), or burning wood in fires used for cooking or to provide heat, etc. changes the state of stored organic carbon from a liquid (e.g. oil) or solid (e.g. coal/wood) into a gas (carbon dioxide) which is released into the atmosphere. Deforestation: vegetation absorbs carbon dioxide from the atmosphere during the process of photosynthesis, converting this to carbon which is stored within all plants (i.e it is a carbon sink). When vegetation is burned, this organic carbon is released into the atmosphere in the form of carbon dioxide, and in so doing becomes a carbon source rather than a carbon sink. Although methane has a shorter lifespan, and consequently, is not as abundant in the atmosphere as carbon dioxide, in terms of it effect as a greenhouse gas, it is much more potent. Methane is produced when organic matter breaks down and also when ruminants digest their food. Decomposing organic matter: landfills, animal waste, sewerage and dams are all human sources of methane. For example, organic matter is trapped behind dam walls where it sinks to the bottom of the dam and decomposes. Bacteria produce methane in the decomposition process, which slowly escapes to the surface and is released into the atmosphere. Landfill gas operations and biodigesters provide a method of mitigation, and not only harness methane that would otherwise be released into the atmosphere, but also provide an alternative source of fuel. Natural gas extraction: methane escapes during oil and gas extraction (e.g. fracking) operations and is released into the atmosphere. Nitrous oxide is a potent greenhouse gas that is released primarily by fertilizers used in agriculture and landscaping, but also during the burning of fossil fuels and other organic matter. Atmospheric nitrous oxide levels have risen by roughly 18% since the Industrial Revolution, spiking rapidly towards the end of the 1900’s. Water is essential for life, and as it is constantly cycling from one state to another, it is not surprising that it is the most abundant of all the greenhouse gases. However, water vapor not only acts as a greenhouse gas, it also increases as the atmosphere gets warmer and provides climate feedbacks. While humans do not play a large direct role in producing water vapor, other human emissions promote atmospheric warming, which in turn promote evaporation that results in more water vapor in the atmosphere. Chlorofluorocarbons (CFCs) are long-lasting greenhouse gases that also destroy the ozone layer. CFCs do not occur naturally in the atmosphere – they are synthetic compounds that only originate from human sources, including: aerosols, foaming agents, refrigerants, and other industrial applications. Oceans have absorbed 20 times more heat than the atmosphere resulting in warmer oceans5,6. The recorded increases in ocean temperatures extend well beyond that of natural climate variation. The boundary of the lower atmosphere (troposphere) that contains our weather has risen by more than 900 feet over a twenty year period between 1979-1999, according to a study conducted in 20037. To gain a better understanding of why this is happening, scientists modeled both natural and human drivers of climate change (volcanic aerosols and solar changes for the former; and greenhouse gas emissions, aerosol pollutants, and ozone depletion for the latter). They determined that solar changes during the 1900s have caused both the stratosphere and troposphere to warm up. But this has been exacerbated by human activities which have led to: 1) an increase in greenhouse gas emissions that causes heat to remain trapped within the troposphere, and 2) a decrease in ozone in the stratosphere, causing less sunlight to be absorbed by the ozone layer, resulting in a cooling of the stratosphere. The combined effects of these two phenomena is responsible for more than 80% of the troposphere’s boundary (known as the tropopause) shift upward. Average global temperatures have increased by 1.4°F over the last century, with the most significant increases occurring in the last 30 years8. Scientists have modeled the Earth’s temperature with both natural and human drivers of climate change and the results show that greenhouse gas emissions are causing the Earth to warm up three times as fast now than in 19509,10. Taking a closer look at where exactly this warming is occurring, scientists have identified that natural climate drivers are short-lived events, and that human emissions are primarily responsible11 for the rapid rise in temperatures that we have seen over the latter part of last century and what we are witnessing today.